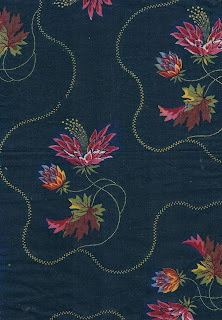 My Dargate book, c. 1830 Mulhouse, contains numerous polychrome (more than 1 color) Indigo prints. These were relatively complicated to print and thus costly. I did reproduce several with my Dargate Indigo line. Here is the technical information that I sent out with orders and below that is my favorite sample ( 8 1/2" X 12") in the entire book!! and probably the reason I purchased the book. "These were the beginning steps to polychrome indigo prints. The original resist paste and indigo dye both produced white and light blue designs on a dark blue background. The old resists were then removed and new areas covered with another paste. The fabric was dyed yellow, giving three additional colors: yellow, green and black. Finally, a pink and red were overprinted. The final product was a dramatic polychrome indigo featuring white, light blue, dark blue, yellow, green, black, red, pink and brown. Wow! Technical assistance with this historical process graciously provided by the Department of Textiles, Fashion Merchandising, and Design, University of Rhode Island: Drs. Bide, Ordonez and Welters." 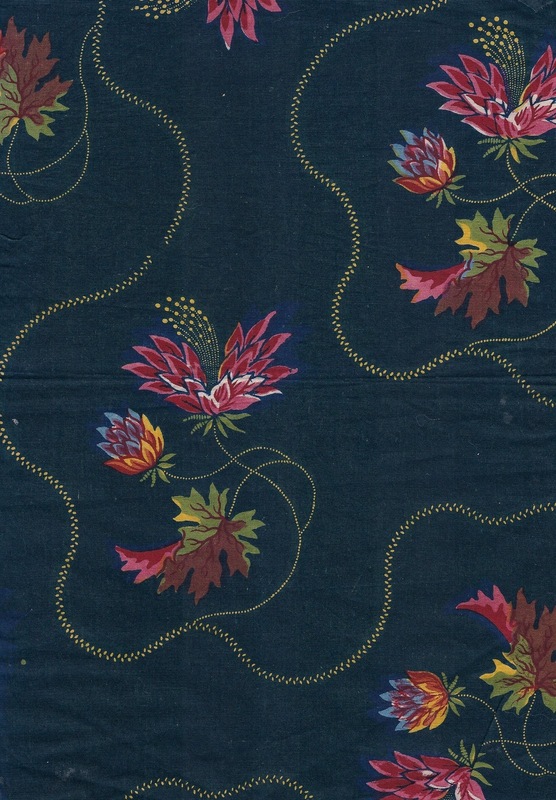 I love to imagine the dresses made with this fabric! I will be out of the country for 2 weeks and probably not able to post. WOW!!!!! I'm left speechless by this!!! And also I loved the Dargate Indigos,if you recall I won first in the professional category in your Dargate Indigos challenge and still have some beloved remnants in my stash. Enjoy your time out-of-country - late winter is an ideal time to travel.